... for my sweet little Luca. Hello there, my title probably made you smile today, and my heart smiles when I think that my gorgeous nephew Luca will receive this in post tomorrow morning( I made sure he will wink, wink). you see Luca is nearly 1 and a half now and is growing up (FAST!!) to be a typical little boy, full of energy, loud and every now and again mischievous. So of course like every parent out there my sister is trying to lay down the rules that will bring peace and harmony to the household( I know what you are all thinking here, well those that have kids of their own at least LOL). Of course this new plan of mummy's doesn't meet Luca's approval and like expected he did rebel against it at first. Perseverance is key and I have heard reports that the plan is finally starting to work (daddy joined in mum's efforts so they work as a team) and my cute little angel is GETTING THE PLAN!!! !LOL How sweet is that? So of course Mimi (that's what Luca calls me, oooh you just don't how much I like that) thought that this kind of good behaviour should be rewarded and she bought him a little present, a DONKEY!! Now this is not your everyday donkey but the softest and squishiest donkey out there. Is supposed to be a pillow and it just feels gorgeous ( found it in my local Aldi for a bargainous £4.95) but what s so perfect about it is that Luca adores anything furry or fluffy, he just loves snuggling up to furry things and I just know this will make his day. Very cute card! I love the soft look! Love your card and hope that donkey and Luca get on!!! 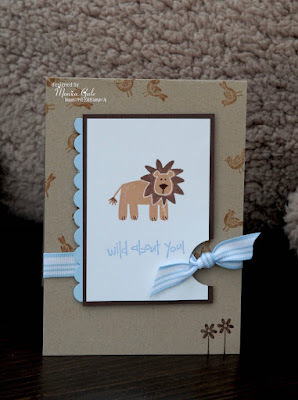 Aww, I love the card Monica, great colours chosen - just love this stamp set, "Wild About You". 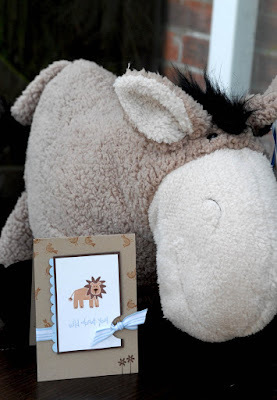 Hope Luca loves his donkey and card. Oh my what a lucky little Luca, I want one too!! Mmmm got some of that ribbhon yesterday, lush!! Awwww bless! Luca sounds like a cutie! I love the card (and the Donkey! ), gorgeous colours! You should've popped into mine for a cuppa last night if you were in Sheffield LOL! Super cute card Monica. Luca is one lucky little boy to have an Aunty like You. 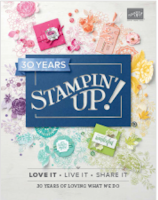 You are a very creative writer as well as a stamper...so much taletn in one little person. Too stinkin' cute! I love that set and the colors you used...tfs!!! That is a lovely gesture and a beautiful card you made him. One of my fav sets also! Your card is great! 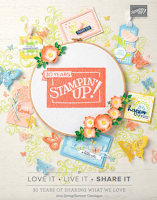 Great layout and that ribbon is yummy! I have given you a tag on my blog. Adorable card Monica! So cute!